Happy New year 2013! Last year was not an easy year. The most vexing were “departures” in the family and among good friends. 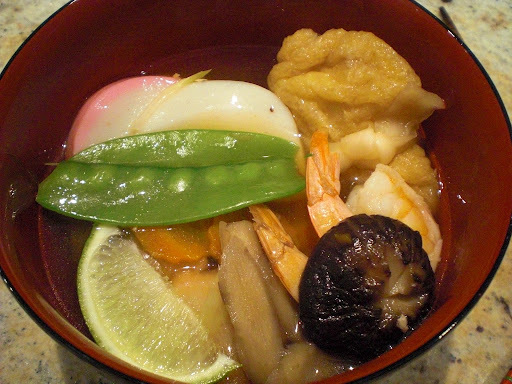 One of the bright spots was that we finally got back our house from construction and, for the first time in the past 3 years, we could sit in our “tea room” to have our new year’s celebration and eat all those Japanese auspicious good luck foods. This year, like the last year, we got Sushi taro’s osechi boxes. 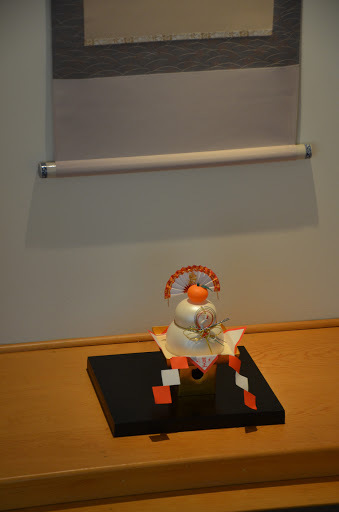 This picture shows our small alcove (or “Tokonoma” 床の間) with kagami-mochi 鏡餅. Of course we bought a fake plastic one with packaged round mochi inside. Digression alert: When I was a child, kagami-mochi or traditional real round “mirror” mochi rice cakes were not packaged or preserved. They were just mounds of pounded rice that remained on display until they were supposed to be eaten (usually January 11, called “kagami-biraki” 鏡開き). Usually, by that time, green mold developed beween the two layers of mochi rounds. I vividly remember my mother scraping the mold off before she could serve them as “zenzai” 善哉, mochi in sweet red bean sauce (which I did not care for-so my mother need not have gone to all that effort to remove the mold). At least, with the packaged mochi, we do not have to contend with scraping off the mold. Oh the wonders of modern technology! 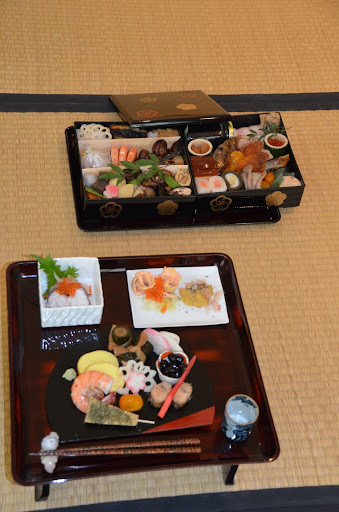 This picture shows new year’s good luck food served on individual lacquered tables as well as the Osechi Box we got from Sushi Taro. 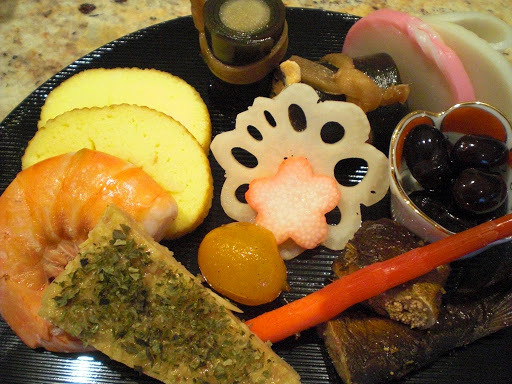 I supplemented the Osechi box by preparing several of the items shown here. From the upper left, daikon namasu 大根なます with boiled octopus and salmon roe, “Russian” marinated salmon, herring roe – this year, there was no terrorist package scare and my mothers “care package” arrived on time and included very nice large herring roe. 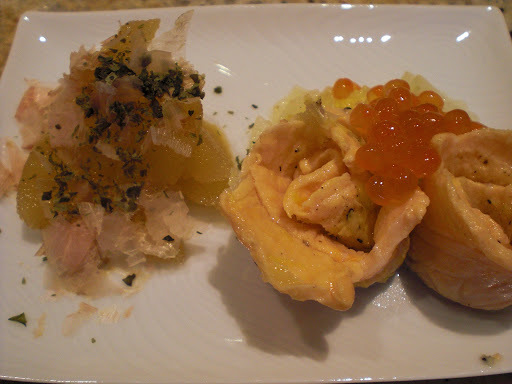 Among the “kuchitori” 口取り appetizers, I made salmon and burdock kelp rolls 牛蒡と鮭の昆布巻き, date-maki roll 伊達巻 and chicken “matsugaze” cake 鶏肉の松風焼き. From the Sushi Taro’s Osechi box, simmered black beans 黒豆, simmered roe bearing sweet fish 子持ち鮎の甘露煮, vinegar-dressed lotus root 花輪蓮根, kumquat simmered in syrup 金柑蜜煮, sake braised shrimp 海老酒煎. As you may notice, many items from the sumptuous Sushi taro osechi boxes have not been touched yet and remain for subsequent feasting. My dikon namasu came out a bit on the sweet side this year. This may be due to the fact I was out of regular rice vinegar and had to use “sushi” vinegar which already contained sugar and salt (despite the fact that I reduced the seasoning especially the sugar). 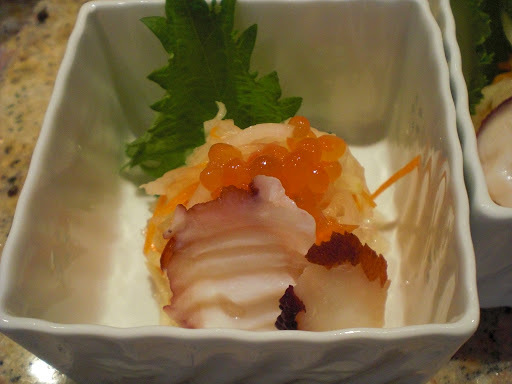 The herring roe were very luxurious large ones from Hokkaido. I prepared them as per usual and they were excellent. The salmon on the right is my mother’s recipe; “Russian” pickled salmon.